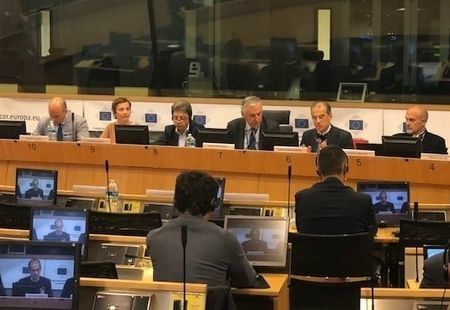 The Conference of Peripheral Maritime Regions (CPMR) attended the latest meeting of the Adriatic Ionian Group at the Committee of the Regions on 17 May, where it provided an update on the AI-NURECC initiative and its goals. Discussions at the meeting, chaired by Mr. Nikola Dobroslavic, President of AI-NURECC partner Adriatic Ionian Euroregion, focused on theEUSAIR implementation and the current status of European Territorial Cooperation Programmes from the Adriatic Ionian area. At the meeting, Giuseppe Sciacca, Coordinator of the CPMR Adriatic-Ionian Task Force, explained that the AI-NURECC Initiative is the result of a bottom-up approach bringing together five key networks (CPMR, AI-EUROREGION, UNIADRION, FORUM AIC, and FAIC) representing regions, cities, universities, chamber of commerce belonging to the AI region. He added that the AI-NURECC Initiative will organise a summer school in September 2018 and a series of training workshops in Albania, Serbia and Montenegro, with the final aim being to contribute to the implementation of the EUSAIR action plan.